At the ERA ESTHETIC laser dermatology clinic you can purchase gift vouchers. Make your close friends happy with an ERA ESTHETIC laser dermatology clinic gift voucher! Beauty is the best present! At Era Esthetic laser dermatology clinic, at 7-57 M. Valančiaus St., Vilnius; at Aušra Medical Centre, 3 P. Lukšio St., Kaunas; and at Era Esthetic Avenue aesthetic and laser medicine centre, at M. Valančiaus St. 7-51, Vilnius. If you have any enquiries about gift vouchers, please call +370 611 55111, +370 611 66111 or +370 611 77111. We will be happy to answer all your questions. ERA ESTHETIC gift voucher is valid at the Era Esthetic Avenue aesthetic and laser medical clinic at 7-51 M. Valančiaus St.; or at the Era Esthetic laser dermatology clinics, at 7-57 M. Valančiaus G., Vilnius and 3 P. Lukšio St., Kaunas. Upon presentation of Era Esthetic gift voucher for the settlement, it is taken and not returned. Each Era Esthetic gift voucher can be used only once and after use it is cancelled. If the price of the procedure is higher than the nominal value indicated on the Era Esthetic gift voucher, then the remaining amount can be paid in cash or by credit or debit card. If the price of the procedure is lower than the nominal value indicated on the Era Esthetic gift voucher, then the difference shall not be reimbursed. 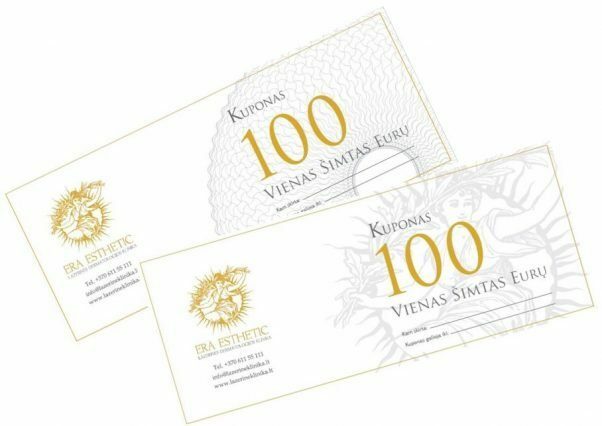 Era Esthetic gift vouchers can be purchased at the Era Esthetic Avenue aesthetic and laser medical clinic at 7-51 M. Valančiaus St.; and at the Era Esthetic laser dermatology clinics, at 7-57 M. Valančiaus G., Vilnius and 3 P. Lukšio St., Kaunas. Era Esthetic gift vouchers are valid for three (3) months from the date of purchase. The date of purchase of the gift voucher is indicated on the gift voucher. Invoices are not issued for purchased gift vouchers. Transfer-acceptance acts are issued.